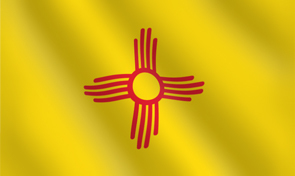 The simple yet symbolic flag of New Mexico has a rich history and even deeper meaning. The red and yellow colors used are the same colors of the Conquistadors who explored New Mexico in the 16th century. The red emblem in the center references the ancient sun symbol used by the Zia - a Native American people indigenous to the region. The Zia believed that four was a sacred number, therefore the symbol has four sections emanating from the center, of which each section has its own four parts. They represent the north, south, east, and west; the four stages of life; and the four seasons. Adopted in 1925, this meaningful flag has been flown over the beautiful land of New Mexico for decades. It has bound the people together underneath the circle of life, and reminds natives of the importance of a strong body, clear mind, pure spirit, and devotion to family.